The outer layer of the goose down arctic jacket features a performance 10,000 mm water-resistant fabrication that's durable, water-repellent, lightweight and breathable. A layer of ﬂeece highlights various parts of the jacket ranging from the pocket liners to the neck trim, providing added comfort. Located under the sleeves are zipper side vents with mesh inserts, helping you to regulate your core body temperature. Hidden thumbholes are revealed when the cuffs are extended, providing added warmth to your hands in frigid temperatures, while preventing wind chill from seeping in. The storm cuffs may be hidden in the jacket sleeve when not in use. The Chenega winter parka features side bellow pockets with buttoned flap closures, an inner chest pocket, and a side arm pocket for convenient, additional storage. On the inside of the jacket are adjustable bungee draw cords that allow you to adjust the fit of the jacket around your waist. PREMIUM WHITE GOOSE DOWN - Triple F.A.T. Goose down parkas are insulated with premium white goose down - one of the best and lightest insulators known to man, providing exceptional warmth and comfort. DETACHABLE REAL COYOTE FUR - A layer of luxurious, Canadian coyote fur lines the hood, providing protection to your face from wind chills. A hidden adjustable wire insert along the fur trim allows you to adjust and maintain the shape of the hood according to your preferences. 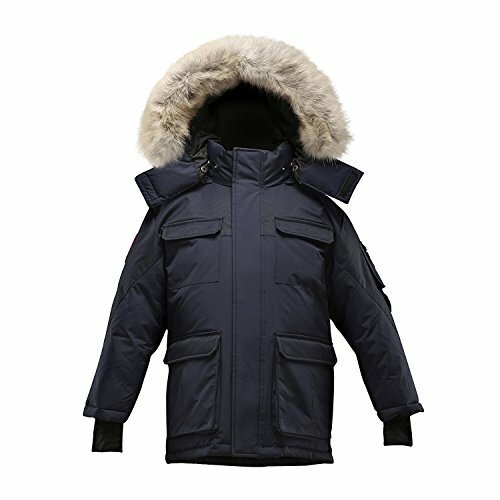 The fur is detachable from the hood and the hood is detachable from the jacket.